Extends the Squarewave Frequency range of one channel (carrier or frequency) up to 4MHz for Electrodes and HF Accessories. How long will the upgrade take? It normally takes a few days for repairs. We often run the unit for a day or two after the repair to assure that all is OK. Return time by USPS is usually 3-4 working days. Put a note in the box with your name, email address, telephone number. You do not have to send accessories such as power supplies, electrode wires, and raytubes. 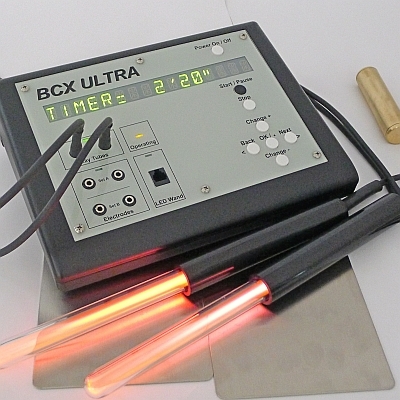 Pack a BCX Ultra in a USPS Medium Flat Rate Box-1 OFRB1I (11" x 9" x 6"). Use a little padding such as small bubble wrap, foam, or crumpled paper towels on the bottom and sides. Fill the box above the unit with the same type of padding. DO NOT SEND BLACK CARRYING CASES. They do not fit in the boxes we use to return your items. If we receive a black carrying case and you wish to have it returned, there will be additional shipping charges. Ship by USPS Priority Mail. Tracking is provided by the Post Office. Keep your tracking number and you can check for delivery status at www.USPS.com Insurance is your option. We have never experienced a lost item, and never had a unit damaged in shipping when packaged this way.